The High Electoral Committee announced on Thursday afternoon that voters in Cairo governorate have backed the new constitution with a 95.2 percent "yes" vote and 4.8 percent “no,” Al-Ahram’s daily print edition reported. 2814000 participated in the referendum out of 6,674,865 registered voters, a 42.2 percent turnout. 2680000 voted yes and 134000 voted no. 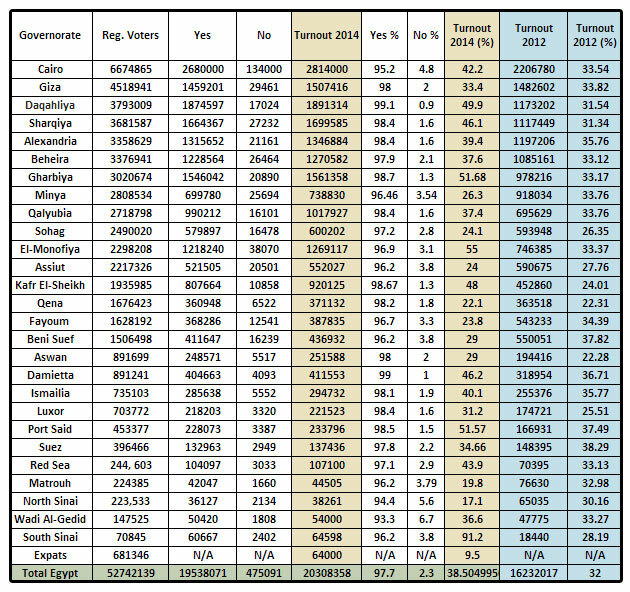 Below are the aggregated vote counts of all of Egypt’s 27 governorates. The turnout of 2014 has surpassed that of the 2012 constitutional referendum by around four million. Below, Ahram Online team compiled a table providing a detailed comparison of voter turnout and results between the 2014 referendum on constitution and the 2012 referendum which took place under the rule of the Muslim Brotherhood. Below, readers will find Ahram Online's blow-by-blow coverage of results as they came in from governorates. The official results are to be announced on Saturday by the Supreme Elections Commission. Turnout: 38261 (17.1 percent) This figure includes voters not registered in the same governorate, unlike in the 2012 constitutional referendum when constituents were only entitled to cast ballots in their respective governoratas. Turnout: 1,699,585 (46.1%) This figure includes voters not registered in the same governorate, unlike in the 2012 constitutional referendum when constituents were only entitled to cast ballots in their respective governorates. Turnout: 1,891,617 (49.9) This figure includes voters not registered in the same governorate, unlike in the 2012 constitutional referendum when constituents were only entitled to cast ballots in their respective governorates. Turnout: 1,507,416 (33.4%) This figure includes voters not registered in the same governorate, unlike in the 2012 constitutional referendum when constituents were only entitled to cast ballots in their respective governorates. Turnout: 1,561,358 (51.68%) This figure includes voters not registered in the same governorate, unlike in the 2012 constitutional referendum when constituents were only entitled to cast ballots in their respective governorates. Turnout: 1,269,117 (55%) This figure includes voters not registered in the same governorate, unlike in the 2012 constitutional referendum when constituents were only entitled to cast ballots in their respective governorates. Turnout: 1,270,582 (37.6%) This figure includes voters not registered in the same governorate, unlike in the 2012 constitutional referendum when constituents were only entitled to cast ballots in their respective governorates. Turnout: 1,346,884 (39.4%) This figure includes voters not registered in the same governorate, unlike in the 2012 constitutional referendum when constituents were only entitled to cast ballots in their respective governorates. Turnout: 1,017,927 (37.4%) This figure includes voters not registered in the same governorate, unlike in the 2012 constitutional referendum when constituents were only entitled to cast ballots in their respective governorates. Turnout: 920,125 (48%) This figure includes voters not registered in the same governorate, unlike in the 2012 constitutional referendum when constituents were only entitled to cast ballots in their respective governorates. Turnout: 219,241 (31.2%) This figure includes voters not registered in the same governorate, unlike in the 2012 constitutional referendum when constituents were only entitled to cast ballots in their respective governorates. Turnout: 411,553 (46.2%) This figure includes voters not registered in the same governorate, unlike in the 2012 constitutional referendum when constituents were only entitled to cast ballots in their respective governorates. Turnout: 600,202 (24.1%) This figure includes voters not registered in the same governorate, unlike in the 2012 constitutional referendum when constituents were only entitled to cast ballots in their respective governorates. Turnout: 137,436 (34.66%) This figure includes voters not registered in the same governorate, unlike in the 2012 constitutional referendum when constituents were only entitled to cast ballots in their respective governorates. Turnout: 251,588 (28.2%) This figure includes voters not registered in the same governorate, unlike in the 2012 constitutional referendum when constituents were only entitled to cast ballots in their respective governorates. only entitled to cast ballots in their respective governorates. Turnout: 738,830 (26.3%) This figure includes voters not registered in the same governorate, unlike in the 2012 constitutional referendum when constituents were only entitled to cast ballots in their respective governorates. Turnout: 64,598 (91.2 %) This figure includes voters not registered in the same governorate, unlike in the 2012 constitutional referendum when constituents were only entitled to cast ballots in their respective governorates. Turnout: 44,505 (19.8%) This figure includes voters not registered in the same governorate, unlike in the 2012 constitutional referendum when constituents were only entitled to cast ballots in their respective governorates. Turnout: 552,027 (24%) This figure includes voters not registered in the same governorate, unlike in the 2012 constitutional referendum when constituents were only entitled to cast ballots in their respective governorates. Turnout: 294,732 (40.1 %) This figure includes voters not registered in the same governorate, unlike in the 2012 constitutional referendum when constituents were only entitled to cast ballots in their respective governorates. Turnout: 371,132 (22.1%) This figure includes voters not registered in the same governorate, unlike in the 2012 constitutional referendum when constituents were only entitled to cast ballots in their respective governorates. Turnout: 107,100 (43.9%) This figure includes voters not registered in the same governorate, unlike in the 2012 constitutional referendum when constituents were only entitled to cast ballots in their respective governorates. Turnout: 233,796 (51.57%) This figure includes voters not registered in the same governorate, unlike in the 2012 constitutional referendum when constituents were only entitled to cast ballots in their respective governorates. 23:40 The hometown of Egypt's ousted Islamist president Mohamed Morsi voted overwhelmingly in favor of the constitution. Results from the village of Al-Adwa in the Nile Delta province ofSharqiya, where Morsi was born, sees 703 approve the charter and 36 reject it. 23:20 Initial vote counting in polling stations across Egypt indicate the 'yes' vote will comprise more than 95 percent of ballots. 22:25 As expected, vote counting in several polling stations across Egypt indicate that the 'yes' vote would comprise the vast majority of ballot papers. Below are several examples, according to Al-Ahram's Arabic site. 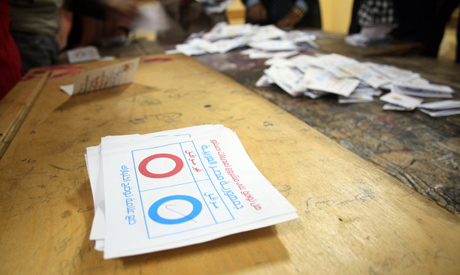 Welcome to Ahram Online's live coverage of the vote counting for Egypt's 2014 constitutional referendum. Egyptians headed to polling stations on Tuesday and Wednesday to vote on a newly-amended national charter, which improves upon the 2012 version that was frozen upon the ouster of Islamist president Mohamed Morsi. As expected, vote counting began right after the end of polling at 9pm CMT on Wednesday. It is widely assumed that the "yes" vote in favour of the constitution will comprise the majority of ballots, given that most of the groups which objected to the referendum, such as the Muslim Brotherhood, announced a boycott and abstained from voting. A festive atmosphere reigned at most polling stations across the country over the two-day referendum, with voters chanting both for the draft constitution and popular army chief Abdel-Fattah El-Sisi. Each polling station must announce the results right after the vote counting and is obliged to allow accredited observers and reporters to supervise the process. Polling stations shall also send results to their respective central electoral committees, which would announce aggregated vote counts. Below is a list of the governorates that voted in the referendum. Results are expected to unfold in the coming hours. 'no' campaigners get arrested for their opinion, and then 98% of voters support the military. Well, they managed to fool the people and bring back the Mubarak days: No freedom of speech, complete control on state media and of course near 100% support. When the media makes a big part of the population believe that the rest are terrorists, and people actually believe it, you know that this country is screwed. Remember, Mubarak use to win "elections" every 4 years with a 99% approval rate. Again, SEEMS LEGIT. Some arab observors are saying turnout is actually no more that 11.2%. So obviously the coup regime is playing fraud and is expected. Haven't you noticed that state television is only reporting one side of the story? When the army took control of the country on july 3rd, they banned all tv channels that didn't belong to them. Now all that you hear is that everyone who opposes Sisi is a terrorist. How can anyone legitimize a media that is controlled by the rulers? We're better than that Egypt. Who are your "Some Arab observers", the ones that terrorized the Egyptians as they were trying to cast their vote? Egyptian fake constitution referendum only receives 38% turnout. They had all state machinery working for it , they made sure that every body votes "Yes" , but they were only able to pull 38% people, that too with lots of rigged votes and suppression of "no" sayers. So looks like 62% people boycotted this fraud referendum. What is the truth...? please if any of the Coup Regime supporter/ Egyptian media could tell the world and Egypt.. (1) If refrendum figures are fair and transparent 18 million said Yes,then where the remaining 18 million egyptian that were out for CC on 30th June..?? Either 33 million on 30th June was a lie or CC support droped 50% after June 30 ? and where are the 22 million signatries of the Tamarod ??? Can the media stop is lies now ? Well said and I would ad that all those who "boycott" the vote were the young generation that were the follower of the Brotherhood. How do Egyptians put up with the same military rule as the world moves on? To the vast majority: well spoken! You're as smart as I thought! As to the districts showing up less than under MB rule referendum, tourist offices would be well advised not to favor them. This is how to measure how real this vote was. For Christians and Muslims ask yourself this question. If Jesus or Muhammad were alive today, would they get 97% approval vote in an election? If Jesus or Muhammad could not get 97% approval in Egypt what makes you think realistically that 97% of Egyptians approved this constitution? This wasn't a vote for a person. This was a vote for freedom. Freedom to practice your religion. Freedom and equality for women. Freedom to think. Who would not vote for freedom. On top of that it was a vote against the brotherhood and terrorism. Who wouldn't vote for that. Despite threats of terrorism the brave Egyptian people stood in long lines to vote yes for freedom no to terrorism. The brotherhood was banned a long time ago for a reason. Haha 98%, democratic? Come on, where is the opposition? Have you ever seen in a well-respected democratic country that a referendum achieve more than 95% yes votes? I have seen this only in thirld world countries where dictatorships are in power. Welcome back under a millitary regime. More dan 90% havent even read the constitution! This explains the way of thinking of some egyptians, where most of the voters were elderly people. There was a total absence of young well-educated people. You can't be serious classifying the brotherhood sheep well educated!! We can see that from the sad language skills. Not to mention lack of debth in any of the thoughts. As for the old people you disrespect are far wiser then you will ever be. That is why they were out there voting for the future of Egypt.